The bounty of citrus in winter months never fails to incite frenzy to save every bit and bob from these fragrant fruits. 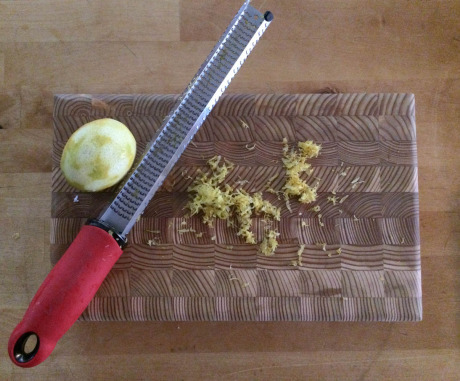 I taught this workshop over the weekend and have many posts on the blog (here, here and here to name a few) dedicated to using up citrus from rind to seed. Freezing zest is a great way to add bright, freshness to your baked goods and dinners throughout the year when your citrus bounty is nonexistent. 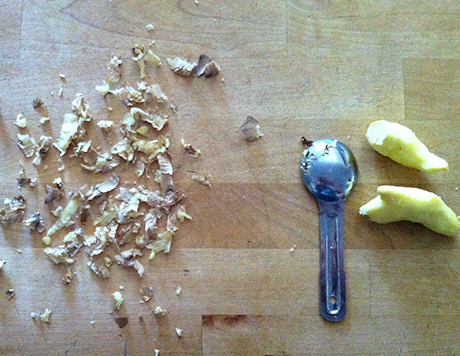 Start by zesting the fruit. 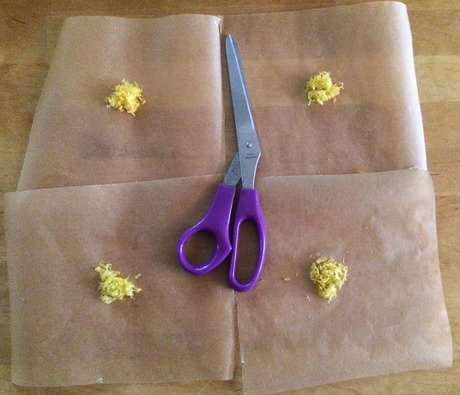 Then cut out a few 6” x 6” parchment paper squares and divvy the zest into 1 tsp measures onto the papers. 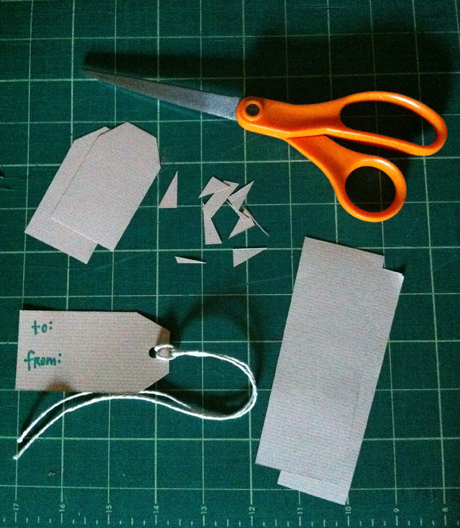 Fold them up tightly. 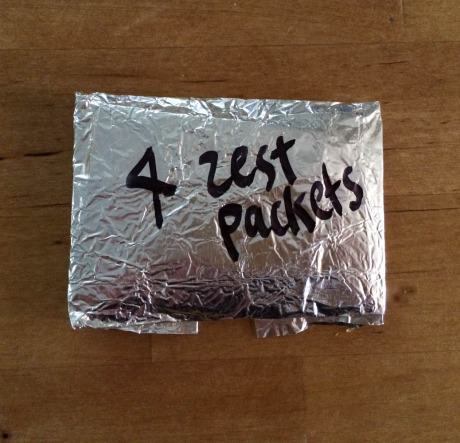 Wrap your folded packets in a piece of tin foil (and don’t forget to date them!). Throw this bundle in a freezer bag for one more layer of volatile oil protection! Try to use these within 6 months for maximum zing. 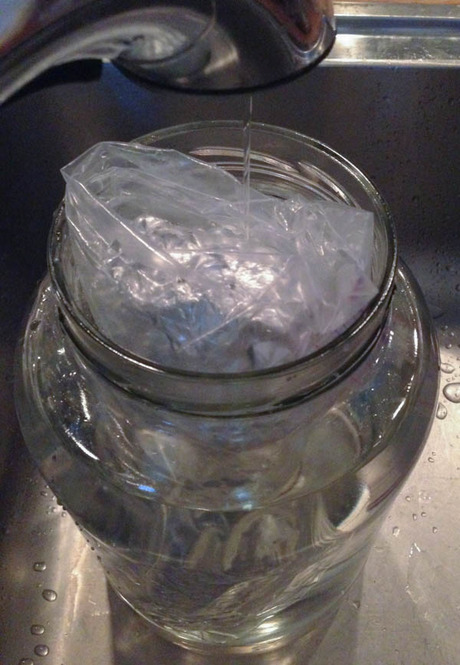 The last hip trick was all about freezing stuff, so this week’s post will be about unfreezing. Ah, defrosting. Leisurely defrosting is the kind of thing people who plan ahead do. To be one of those kinds of kitchen people, I strive. The plan-ahead people will usually safely defrost by just putting something in the fridge and cooking it the next day when it’s fully defrosted. Well, for the non-plan-ahead types, running something under a tiny stream of cold water (for a maximum of 2 hours) is also an acceptable way to defrost, and quickly at that. However, I don’t feel so great about letting all that water trickle down the drain. I used a gallon jar (another great way to use them around the house) to capture batches of water as we defrosted some fish filets last night. Yes, you have to periodically monitor the progress of the jar, but your houseplants (or trees or garden) will be so happy you did. Ok, so I know these are hip helpful HOME tips, but in the likely event you leave your home for summer vacationing, here’s a way to keep rocking the thoughtful living. Just think if we all started to save a cup during air travel, think of how much plastic we’re keeping out of the waste cycle.